SHOP SALE ITEMS ONLY ON ETSY! SALE! //Honey Home Hair clips. Cute bridal headpiece. Gold opal. SALE! //IVY COMB - dazzling crystals, seed beads leaves, silver ornaments and freshwater pearls built into a beautiful bridal comb. SALE! //PETRA HEADPIECE - handmade wax bridal hairpiece in traditional Spanish style. SALE! //Crystal and pearl bridal comb. Style: WALTZ // intricately beaded, pearl headpiece, ready to ship. SALE! //MARGOT HEADPIECE - dazzling, double crystal bridal headband with ribbon ties. SALE! //AGATHA- Crystal and pearls bridal halo/headband. SALE! //beaded navette crystals, freshwater pearls and crystal chain on ivory mesh bridal belt with ribbon ties. SALE! //ANDREA BELT - hundreds of beaded crystals on rayon mesh bridal belt with ribbon ties. Doubles as a headband for a sparkling bride. Rewriting the rules of bridal accessories design from our Vancouver studio! We're an accessories brand based in beautiful Vancouver. 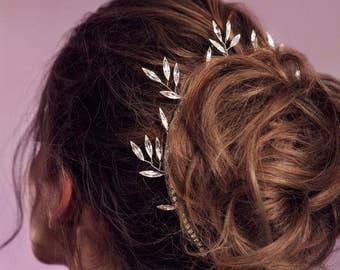 We design hair accessories such as headpieces, combs, headbands, halos and hair pins. We also make bridal veils and lately we've coming up with a few pieces of jewellery. We're inspired by nature, music and women. We're into all forms of art and cultures diversity. We're all about mixing trends and techniques that result in very eclectic collections. The wolf embodies the vision behind our brand: to make top-notch headpieces for the strong, fun and fearless wanderers. We ship ready to ship items within two days after purchase. Made to order pieces can take up to 6 weeks. If you need a rush order, contact us and we will do everything we can to ship your headpiece in time! 206 - 713 Columbia St. The product must be sent back in its original package and we have the right to refuse items that are stained, damaged or not in its original condition. The buyer is responsible for shipping costs as well as any taxes, duties, and courier fees incurred by the return. If an item was defective or damaged by a mistake on our part, a refund will be issued for both delivery and return shipping charges. The refund will be issued in the same form as original payment within 3 days of return receipt. We do not accept liability for shipping loss or damage of returned goods. International duties and taxes are not refunded. Contact your local customs office for information on international duties and taxes refunds claims. We do not do returns on sale items, custom orders or altered pieces. We charge a flat rate of CAD $15 to the US,Canada and Mexico and CAD $35 to the rest of the world. International orders are sometimes subject to duties and taxes fees which are not associated with Olivia The Wolf and are the buyer's responsibility. Please contact your local customs office for more information. Orders to the US and Mexico qualify for a preferential tariff treatment under the NAFTA agreement. All Canadian, US and International orders are shipped using Canada Post. In Canada it usually takes no longer than a week, in the US, between 4-7 business days and internationally, between 6-10 business days. Rush orders can be arranged through DHL, which usually takes no longer than a week internationally, and as little as 1 day for the US. DHL orders are not able to be shipped within Canada. Additional charges may apply on rush orders.